Made in the USA, Anchor kitchenware is built tough and designed to last through pretty much anything that goes on in the kitchen. When you buy an Anchor product, you can feel assured you're getting an item that's high quality... They're a brand you can really trust. If you need a way to keep your cakes secure and safe, Anchor's Cake Dome might be the perfect thing. 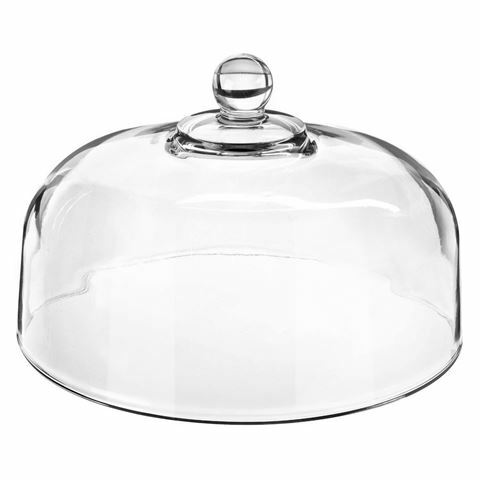 Cake domes are a fantastic way to serve up your cakes, which you’ve no doubt put a lot of effort in to. Pair it with a cake knife and some dessert forks, and you’re ready for an extravagant affair indeed. Crafted from Anchor's tough tempered glass. Best used with a cake plate roughly 30cm in diameter. A fantastic way to serve up your cake. Dimensions: 28cm (d) x 19cm (h).